11 Lives Saved During First 8 Days of 40 Days for Life-Dallas! 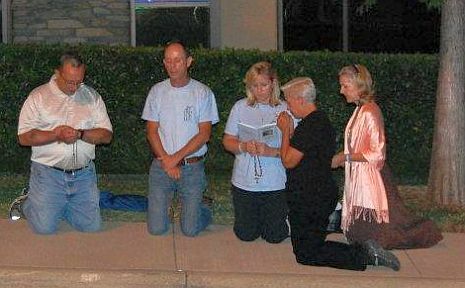 Tonight: Prayer Vigil at Planned Parenthood's "Cocktails For a Cause"
In a society and world where life is increasingly disrespected, it is important that we remind ourselves that Jesus came not only to give us eternal life but life in this world. Our duty to respect life is constant and never ending, but once each year for forty years the Church in America has set aside October as Respect Life Month to emphasize to us and to others Jesus’ new Commandment of unselfish love. From conception to old age many regard human life not as God’s greatest gift, but as inconvenient and and a burden. Dallas, TX: The first day of the 40 Days for Life vigil, three mothers chose life for their babies! Since the that first day, 8 more babies have been saved from abortion at the 40 Days for Life-Dallas vigil site, bringing the total lives saved to 11 in only 8 days (plus 4 more reported by the nearby Community Mobile Sonogram Unit)! Praise be to God!! Mark the midpoint of the 40-day campaign with a family picnic (thanks to Holy Smokers who will be grilling out! ), great music and pro-life speakers, including Father Michael Guadagnoli of St. Pius X, Joe Baker of Save the Storks Counseling Ministry, Father Seraphim Hipsh of St. Sava Orthodox Church and Corinne Kelly with UTD Students for Life! STOPP Dallas is organizing a pro-life presence outside Planned Parenthood's annual "Cocktails for a Cause" fundraiser; the public witness will be from 5:30 - 7/7:30 p.m. Some carpooling and parking available. Learn more.
. Sponsored by STOPP Dallas. WASHINGTON—In advance of the 2012 elections, the U.S. bishops reaffirmed their 2007 document, Forming Consciences for Faithful Citizenship, in this coming election cycle and beyond, as the “continuing teaching of our Bishops’ Conference and our guidance for Catholics in the exercise of their rights and duties as participants in our democracy.” Continue reading. Bishop Farrell released a teaching statement in conjunction with Bishop Vann of Fort Worth on moral considerations when voting in October 2008. You can read that statement at prolifedallas.org/voting. There were two state-sanctioned executions in the United States on September 21, 2011. In Georgia, Troy Anthony Davis, an African American man, was put to death for the 1989 murder of Savannah police officer Mark MacPhail. In Texas, Lawrence Brewer, a white supremacist, was executed for his participation in the racist hate crime dragging murder of James Byrd in Jasper in 1998. As theologians, scholars, and social justice advocates who participate in the public discussion of Catholic theology, we protest the state-sanctioned killings of both of these men, and we call for the abolition of the death penalty in the US. . .